A perplexing distress call. A missing crew. Only one marine can save them. Sergeant Andrea “Andy” Dolan leads a squad of fearless marines into the depths of space. After the Star Chaser receives a distress call from the star base Zenith, Andy’s squad is sent to investigate. 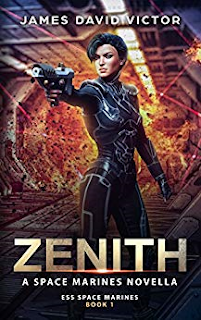 When all heck breaks lose, there is only one person who can save the crew of the Zenith and her own squad.